One of Selkirk College’s top Hairstylist Program graduates has cut, coloured and up-done herself to a successful career in a downtown Vancouver salon. Full of enthusiasm and ambition, she’s just 20 years old. Amber Beckjord graduated from Selkirk College’s Hairstylist Program in 2014 at the age of 17 passionate about all things hair. She graduated at the top of her class with a 4.0 GPA and a Gold Medal earned at the BC Skills Competition in Hairdressing. Inspired by her uncle Anthony Crosfield, one of Canada’s most celebrated hairstylists, Beckjord is now a full-time stylist at his Union Salon in South Granville, Vancouver. She’s fully booked and loves being part of a highly skilled team of stylists working in the trendy salon. 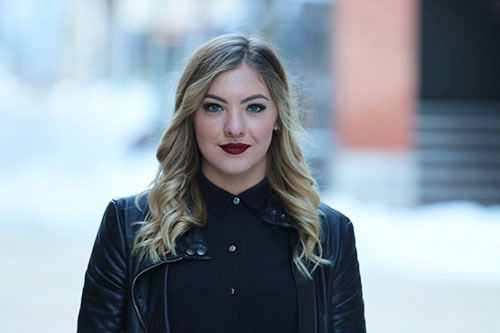 Amber Beckjord graduated from the Hairstylist Program at Selkirk College in 2014. The 20-year-old stylist now works at Union Salon in Vancouver and enjoys her chosen profession and the creative opportunities it continuously provides. She feels at home there, having spent summers as a young teen under Crosfield’s guidance - “sweeping floors and keeping my eye on what’s going on.” But she knows that entering the salon environment can be daunting for young stylists and she credits her Selkirk College experience with giving her the added confidence she needed. Beckjord has taken that foundation and made it work for her. She continues to take part in competitions, frequently travels for professional development and participates back stage in big-time hair shows, a highlight for her as it broadens her understanding of a vast industry. “You learn so much working shows. Outside the salon environment, you are exposed to many more elements of the industry, like photography and modeling. I enjoy meeting people and making connections. I am open to learning as much as possible from many people. Everyone has something to offer,” she says. A high school grad of Mount Sentinel Secondary, Beckjord describes herself as growing up “in the woods.” Recently back in the West Kootenay for the holidays, Beckjord relished being with her family and friends, enjoyed some snow time at Whitewater Ski Resort and gave her mom and a few lucky friends a haircut - turning the kitchen of the Winlaw home she grew up in into a pop-up salon. “I always bring home my scissors,” she says. Sentimental about her roots, she sees the instructors at Selkirk College’s Hairstylist Program supporting her to where she is today created a strong sense of community. Beckjord is happy with her flourishing career. It’s profitable, flexible and allows her to explore her own style and creativity while working with clients. Learn more about the Hairstylist Program at Selkirk College and follow us on Facebook.